You agree to our terms & conditions upon signing up for a course with London Tattoo Academy. 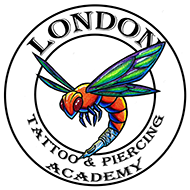 London Tattoo Academy is hereafter referred to as LTA. Students are asked to be in attendance 10-15 minutes before class start time. By attending our courses you give your consent to any photographs or videos to be used for promotional use on our website/social media. Smoking in the Academy is prohibited. The use of drugs during any of our courses will not be tolerated and will result in immediate cancellation of your course with no monies refunded. All payments taken through our website are secured by our SSL Certificate. Deposits can not be transferred to another date. The rest of Course fees are due upon commencement of your chosen course. LTA Teachers are Buddy and Sabrina. No persons under the age of 18 are permitted to take any course at the Academy.